The expansion of Medi-Cal health care services — which took effect on January 1, 2014 — to newly eligible parents and childless adults who were previously excluded from the program and whose incomes are at or below 138 percent of the federal poverty line (equal to $16,243 for an individual in 2015). Increased enrollment of low-income Californians who were already eligible for Medi-Cal prior to implementation of the ACA and who have since signed up due to new outreach efforts, simpler eligibility and enrollment rules, and other factors associated with the implementation of health care reform. This post draws on the most recent state estimates in order to highlight five key facts about Medi-Cal enrollment and funding as policymakers prepare to debate state budget priorities for the 2015-16 fiscal year, which begins on July 1. 1) Medi-Cal enrollment has increased by 4 million over the past two years, primarily due to implementation of federal health care reform and the phase-out of the Healthy Families Program. As shown in the chart below, Medi-Cal enrollment is up by slightly more than half — from just under 8 million in 2012-13 to nearly 12 million in 2014-15, the fiscal year that began this past July. Two major policy changes contributed to this substantial increase. The first is California’s decision to fully implement the ACA, including expanding Medi-Cal coverage to nonelderly adults who previously were ineligible. About 2 million newly eligible Californians are expected to be enrolled in Medi-Cal as of June 2015 due to the program expansion. An additional 1.1 million Californians who were already eligible for Medi-Cal prior to health care reform — but who had not previously signed up — are expected to be enrolled in the program as of this coming June. A second — and often overlooked — factor that contributed to the recent jump in Medi-Cal enrollment is state policymakers’ decision, back in 2012, to eliminate the Healthy Families Program (HFP). By November 2013, California had shifted, to Medi-Cal, hundreds of thousands of low- and moderate-income children who previously received health, vision, and dental care through the HFP. As a result of this change, more than 900,000 children who otherwise would have been enrolled in the HFP are instead receiving services through Medi-Cal. 2) The number of Californians enrolling in Medi-Cal as a result of federal health care reform is much larger than the state initially anticipated. One year ago, the Brown Administration projected that about 800,000 Californians who became newly eligible under the Medi-Cal expansion would be enrolled in the program as of June 2015. While this seemed a large number at the time, it turns out that this projection was actually well below the mark. As noted above, the Administration now expects 2 million newly eligible Californians to be enrolled in Medi-Cal as of June 2015 – more than twice the enrollment gain that was projected a year ago. The Administration also has doubled its estimate — from 552,000 to 1.1 million — of the number of already eligible Californians who will be enrolled in Medi-Cal as of June 2015 due to federal health care reform. In short, at least in terms of enrollment, ACA implementation in California has been more successful than advocates and state policymakers ever could have imagined a year ago. 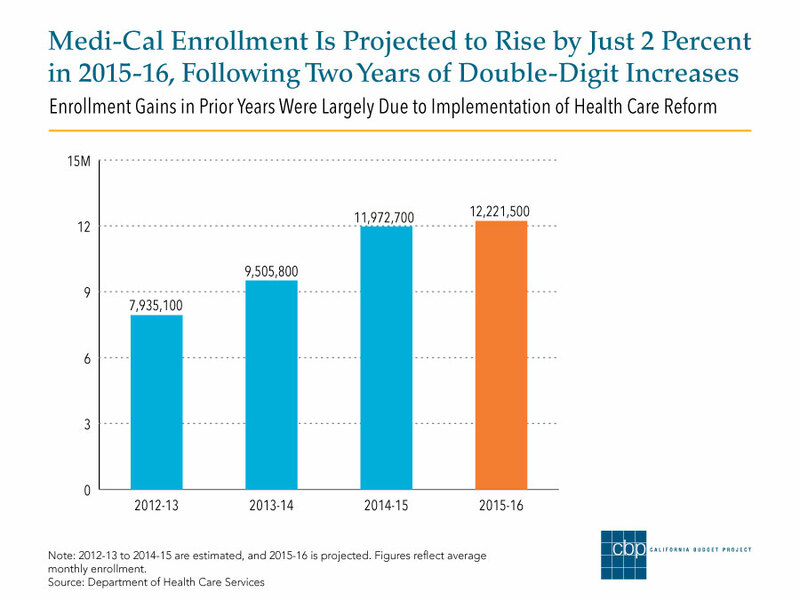 3) Medi-Cal enrollment growth is stabilizing following two consecutive years of double-digit increases. Medi-Cal enrollment is projected to rise by just 2 percent — to 12.2 million — between 2014-15 and 2015-16. In contrast, enrollment increased by nearly 20 percent from 2012-13 to 2013-14 and by 26 percent from 2013-14 to 2014-15, mainly due to the effects of health care reform and the elimination of the HFP. 4) The federal government will provide an estimated $17 billion in 2015-16 to support health care services for Californians who enroll in Medi-Cal due to federal health care reform. $14.3 billion to support services for Californians who are newly eligible for Medi-Cal under the program expansion. The federal government is paying the full cost for this group through 2016, phasing down to a still-high 90 percent of the cost by 2020. $1.2 billion to support services for Californians who sign up for Medi-Cal through a new “Express Lane” enrollment pathway. California adopted a new process to reach out to certain Californians and expedite their enrollment in Medi-Cal based on information that’s already available to the state. This process primarily targets adults and children who receive CalFresh food assistance, but who are not yet enrolled in Medi-Cal. The federal government is paying nearly all of the cost for these “Express Lane” enrollees, who largely consist of low-income adults who are newly eligible for Medi-Cal. $1.1 billion to support services for Californians who were already eligible for Medi-Cal prior to implementation of health care reform and who have since enrolled due to simpler program rules and other factors. The federal government is expected to pay slightly more than half of the cost for this group. $0.6 billion to support services for Californians who sign up for Medi-Cal through a new hospital-based enrollment option. Hospitals may now enroll Californians in Medi-Cal for up to two months based on preliminary information provided by patients (a status known as “presumptive eligibility”). Individuals must later submit an application and be found eligible in order to extend this temporary coverage. The federal government is paying most of the cost for these enrollees, who largely consist of low-income adults who are newly eligible for Medi-Cal. 5) The state’s “net cost” for Californians who enroll in Medi-Cal due to federal health care reform is substantially smaller than the “sticker price” highlighted by the Governor. State policymakers redirected — from the counties to the state — a substantial share of the state dollars that counties have historically used to provide health care to uninsured, low-income residents. This fund shift is projected to total nearly $700 million in 2015-16, with these dollars used to reduce state General Fund spending. After taking this fund shift into account, the state’s projected cost for ACA-related Medi-Cal enrollment in 2015-16 “nets out” to about $400 million ($1.1 billion minus $700 million). State policymakers also established a tax on Medi-Cal managed care organizations (MCOs), with a portion of the revenues used to offset state General Fund spending. As Medi-Cal enrollment has increased under health care reform, so have MCO tax revenues, which in turn boosts the benefit to the state’s General Fund. How much of this benefit is attributable to higher Medi-Cal enrollment under health care reform? Unfortunately, state budget documents don’t provide an answer. 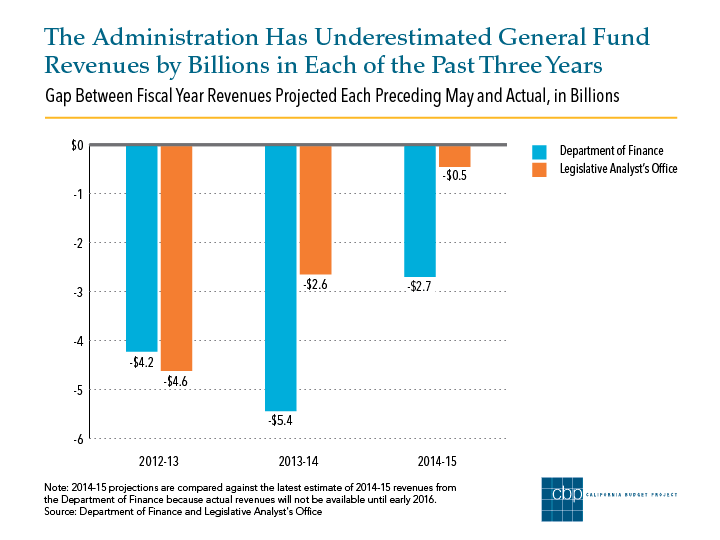 However, a review of other state data suggests that this General Fund benefit will likely exceed $400 million in 2015-16. An offset of this size would further reduce the state’s net cost for ACA-related Medi-Cal enrollment to $0 in 2015-16, after taking into account the $700 million state fund shift from counties described above. Beyond ACA Implementation: What Issues Could Be on State Policymakers’ Agenda in 2015? California’s success in implementing federal health care reform – including the enrollment of an additional 3 million Californians in Medi-Cal — speaks to the pent-up demand for affordable health care coverage as well as the difficult economic circumstances that many residents face in the aftermath of the Great Recession. In order to qualify for Medi-Cal, a nonelderly adult with no dependent children must have an income below roughly $1,350 per month — a paltry sum in a state where the fair market rent for a one-bedroom apartment exceeds $1,000 per month. Clearly, Medi-Cal provides a health care lifeline for millions of low-income Californians and is a critical piece of the state’s health care infrastructure. But the state’s long-term goal should be to reduce the number of residents who live below or near the poverty line — and who thus qualify for Medi-Cal — by helping families boost their incomes, such as by further increasing state’s minimum wage and creating a state earned income tax credit (EITC). While rising incomes would cause some residents to lose eligibility for Medi-Cal, they could purchase coverage — with federal financial assistance — through Covered California, the state’s health insurance marketplace that was established as part of the ACA. In addition, more work is needed to ensure that Californians who continue to live on poverty-level wages have access to necessary health care services. Expanding health care coverage to undocumented immigrants in California — including through Medi-Cal — is already on the agenda, as we noted earlier this month. Lawmakers might also consider repealing the 10 percent reduction to Medi-Cal provider payments that the state began implementing in 2013 — a cut that may be discouraging some providers from participating in Medi-Cal even as enrollment continues to rise. These are important policy questions to watch as California seeks to build on the progress already made in expanding coverage as envisioned in federal health care reform. A new report from the California Budget Project (CBP) examines the 2015-16 state budget proposal released by Governor Brown last Friday. The top-level report summary is provided in this post, and the full analysis is available on the CBP’s website. Stay tuned to this blog for additional analysis and commentary on the Governor’s proposal and this year’s budget deliberations. On January 9, Governor Jerry Brown released his proposed 2015-16 state budget. The Governor proposes to spend $113.3 billion from the state’s General Fund in 2015-16, an increase of $1.6 billion (1.4 percent) over the estimated spending level for the current fiscal year (2014-15). Yet, even with increased revenues and a continuing economic recovery that has yet to reach many Californians, the Governor prioritizes fiscal austerity over investing in broadly shared prosperity. While the Governor’s proposed budget includes long-term plans for paying down budgetary debt and saving for a rainy day, it lacks a similar vision for reinvesting in people and communities and ensuring that all Californians share in the state’s economic gains. The Governor’s proposed 2015-16 budget is heavily focused on implementing policy changes approved in prior years. As required by voter approval of Proposition 2 this past November, his proposal sets aside a portion of revenues — $2.4 billion — with half deposited in the state’s rainy day fund and half used to pay down budgetary debt. The Governor’s proposal also reflects the ongoing implementation of federal health care reform and includes $4 billion for the state’s new K-12 school finance system, which is designed to direct additional resources to disadvantaged students. A sizable boost in funding for schools and community colleges is the result of the tax increases of Proposition 30 passed in 2012 and a growing economy. While these initiatives move the state forward in important ways, the Governor’s proposed budget fails to lay out a plan to tackle California’s biggest challenges: high levels of unemployment and poverty, widening income inequality, and a safety net severely weakened by years of funding cuts. An improving fiscal outlook provides an opportunity for policymakers to rebuild essential public services and systems — such as by continuing to reinvest in child care and preschool programs, strengthening employment services, helping students and families afford a college education, and increasing assistance for low-income seniors and people with disabilities. Failing to reinvest means that many Californians could be left out of the state’s economic future and puts that future at risk. As University of California (UC) students and their families enjoyed the holidays together, many of them were likely fretting over the prospect that their tuition may increase for the upcoming 2015-16 school year. 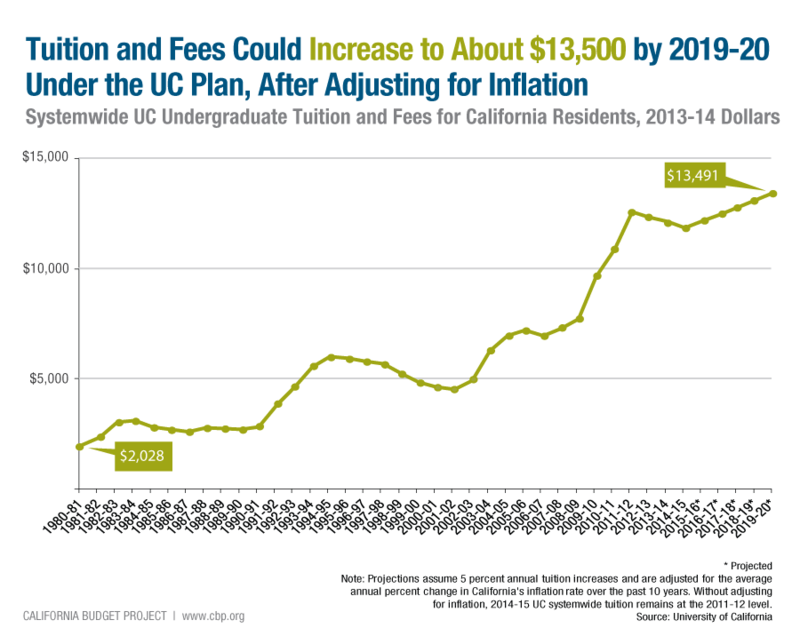 Under a plan adopted by the UC Board of Regents last month, UC tuition for California residents could increase by up to 5 percent annually for the next five years. That means that tuition could rise to nearly $13,500 by 2019-20, after adjusting for projected inflation, a significant increase from the current level of $12,192 (see chart). UC’s new plan runs counter to a separate plan set forth by the Governor in 2013 to give the UC and the California State University (CSU) annual state funding increases for four consecutive years in exchange for freezing tuition for California residents through 2016-17 at 2011-12 levels. This year’s budget agreement, signed in June, continued that plan and included modest funding increases of about $140 million each for CSU and UC in 2014-15. In early 2014, the Governor proposed 4 percent state funding increases for both CSU and UC in 2015-16 and 2016-17, the third and fourth years in the plan. However, UC President Janet Napolitano insists that it is not enough and that tuition will have to go up unless the state provides additional funds. CSU has also signaled it needs additional state funding by recently reducing enrollment targets for 2015-16 and raising the possibility of reducing freshman admissions this coming fall unless additional funds are provided. For both CSU and UC, two sources of revenue — state funding and tuition — make up the vast majority of their core funding, which are dollars that support activities related to their primary education functions. As detailed in our report earlier this year, From State to Student, state disinvestment in higher education in recent decades has resulted in steep tuition increases at both institutions and has shifted a larger share of higher education costs from the state to students and families. Since 1990-91, tuition and fees have more than tripled at CSU and more than quadrupled at UC, after adjusting for inflation. Direct General Fund spending on a per student basis at both CSU and UC has generally been on the decline during this period and, in recent years, has been at or near the lowest point in more than three decades, after adjusting for inflation. When state funding for CSU and UC gets cut or does not keep up with increasing enrollment, as California’s population grows and its economy changes, these institutions have very few options available to them. One is to raise tuition rates. Another is to reduce enrollment growth, as UC and CSU have each proposed to do in 2015-16, unless they receive additional state funding. This is an issue that we, and surely many students and families, will be watching closely as we approach the release of the Governor’s proposed 2015-16 budget in January. Stay tuned for more CBP analysis on this topic. “The new budget forecast from the Legislative Analyst’s Office is encouraging on some key fronts, with the economy continuing to recover and the state regaining its financial footing. California’s public K-12 schools and its community colleges are expected to see additional dollars, both in the current budget year and looking ahead to 2015-16.